Happy! 節約生活 in アメリカ: Krispy Kreme: Buy a Dozen Original Glazed Doughnuts Get Another for 76¢ Tomorrow! 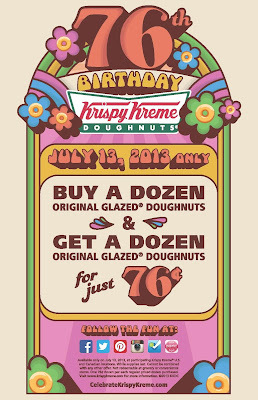 Krispy Kreme: Buy a Dozen Original Glazed Doughnuts Get Another for 76¢ Tomorrow!